PSYOP/MISOC targets foreign governments, groups, and individuals. The government program is similar to journalism, a mode of communication that spreads information, but often spins the narrative, according to Colonel Curtis D. Boyd, Chief of Staff of the JFK Special Warfare Center and School at Fort Bragg, who gave a lecture on “The MISTRY* of PSYOP: Putting MISO in Perspective” in 2011. The mission of the Military Information Support Operations Command (MISOC) is to influence enemy, neutral, and friendly nations and forces into holding favorable opinions and/or taking complementary actions regarding ongoing operations by the United States and its allies. “Senior ranking U.S. military leaders have so distorted the truth when communicating with the U.S. Congress and American people in regards to conditions on the ground in Afghanistan that the truth has become unrecognizable, ” Lt. Col. Daniel Davis told Democracy Now! in 2012. Before his death, Michael Hastings was one of the first to obtain Lt. Col. Davis’s 84-page report and published it in Rolling Stone magazine. MISO manipulates their targets into distributing information using logic, fear, desire, and other mental factors to trigger desired emotions, attitudes, or behaviors. It is vital for MISO communicators to fully comprehend how the target population acts, thinks, and communicates. In 2010, the unpopular Psychological Operations field was rebranded as Military Information Support and Operations. PSYOP = MISO. The unit, which currently operates under U.S. Army Special Operations Command (USASOC), is comprised of less than 3,000 members. MISO activities are built upon the idea that human will is shaped by information, beliefs, and perceptions. In the 2013 National Defense Authorization Act, the use of psychological operations through propaganda on U.S. civilian populations was legalized. This type of information warfare comes in the form of propaganda approved by the Broadcasting Board of Governors. “The Smith-Mundt Modernization Act of 2012 appears to serve this purpose by allowing for the American public to be a target audience of U.S. government-funded information campaigns. Last month, a pair of Military Information Support Operations (MISO) instructors from Special Operations Command Forward Northwest Africa provided training to a small group of Moroccans in Tifnit, Morocco. This opportunity was only possible because of Exercise Flintlock 2017, which involved more than 2,000 military personnel from 24 African and western nations. A MISO communicator must understand exactly what they are trying to communicate before engaging with a target they seek a connection to, in addition to where and how that information exchange should take place. An optimized audience analysis is critical for successful MISO actions. In order to be effective, MISO-trained personnel must be experts when it comes to current events, history, culture, linguistics, and socio-political characteristics of their intended audience. Consider any modern U.S. military operation, and chances are that the Air Force’s EC-130J Commando Solo MISOC plane was nearby attempting to influence the minds of the civilians below. What exactly does the EC-130J Commando Solo do? The U.S. Air Force uses the Lockheed aircraft in support of psychological operations for MISOC. The specially-modified four-engine Hercules transport is tasked with conducting Military Information Support Operations (MISO) and civil affairs broadcasts in radio, television, and military communications bands. How has the Lockheed EC-130J Commando Solo been modified? The aircraft has received enhanced navigation systems, self-protection equipment, air refueling capabilities, and the ability to broadcast their own signal over AM and FM radio, UHF and VHF television bands, or override broadcast stations on the ground on all worldwide standards. The 193rd Special Operations Wing operates a fleet of three of these EC-130J aircraft. They have quite literally been converted into flying radio and television stations. A recent internet conspiracy involving two AM radio broadcasts recorded on video in New Jersey and one in Iowa from September 2016 warned of what appeared to be an imminent attack on Washington D.C. Is this how a MISO operation might look to an ordinary civilian? Could conspiracy theories and numerous strange ‘coincidences’ be manipulated to trigger desired emotions, attitudes, or behaviors in a target audience? Are we suggesting this is what actually occurred? Certainly not. It is impossible to verify without behind-the-scenes access. However, such a tactic seems to match MISOC capabilities and strategy. Could this AM radio broadcast have been a trap set in the battlefield of modern media information operations orchestrated by MISOC? Who knows. On April 26th, we tracked an EC-130J Commando Solo plane on radar taking off from an airfield just north of Harrisburg, PA. The Air Force’s secret psyops plane then flew to Niagara Falls, lowered altitude, and circled the area multiple times. This occurred during a massive nuclear attack drill (Operation Gotham Shield) surrounding New York City, in addition to a massive Washington D.C. terrorism drill. What was the EC-130J Commando Solo doing circling Niagara Falls at a low altitude? Before we get too far ahead of our ourselves, yes, what we witnessed on radar was also observed by civilians on the ground. Could the U.S. government be running drills to someday broadcast their own signal over AM and FM radio — or UHF and VHF television bands — by overriding broadcast stations on the ground using the EC-130J Commando Solo when the next major terrorist attack, or perhaps an EMP, takes place? Or are they already doing so? 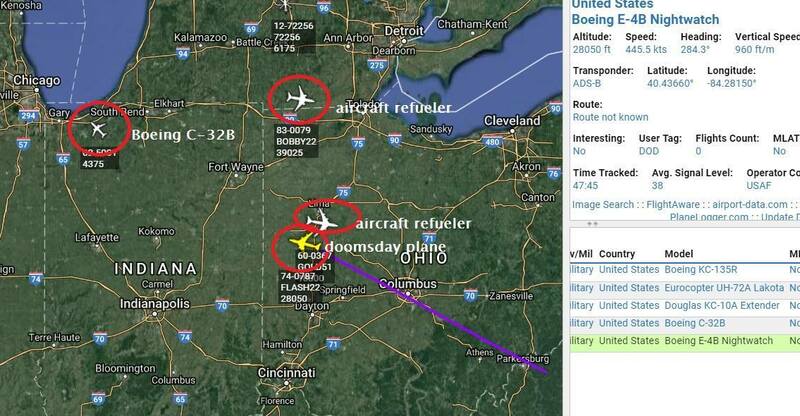 Could it be that these military aircraft were rehearsing U.S. plans for a doomsday situation? Ironically, or perhaps not, the United States launched an unarmed intercontinental ballistic missile off the coast California on the very same day — during escalated tensions with North Korea. MISO carries out missions for the United States Army Special Operations Command (USASOC), and USASOC’s job is to synchronize planning of global operations against terrorist networks. “Military Information Support Operations (MISO), previously known as Psychological Operations (PSYOP), uses themes and messages to reach target audiences in order to influence their emotions, motives, reasoning, and ultimately the behavior of foreign governments, organizations, groups, and individuals.” – Reaching The Target Audience, a thesis presented to the Faculty of the U.S. Army Command. If MISOC is manipulating targets into spreading information about ongoing operations using only logic, fear, desire, or other mental factors to trigger specific emotions, attitudes, or behaviors of U.S. civilian populations, this is exactly how it could be done. This is how it has already been done in foreign countries. Have Americans fallen victim to themselves, being psychologically manipulated by their own government into an unknown end goal? A massive campaign USASOC has tasked MISOC with carrying out by using the current events, culture, history, news websites, conspiracy theories, and socio-political characteristics of their intended target audience? “Just as important to understanding NS propaganda is the importance of conducting a thorough Target Audience Analysis(TAA). The process of understanding a target audience is critical to determining if your Target Audience is susceptible and capable of being influenced. If a MISO operator does not understand the depth of an individual’s condition, concerns, fears, ambitions, and vulnerabilities, then MISO will not be effective. It is hoped that this document will assist in a more analytical formulation of Target Audience Analysis concepts, plans, programs, themes, and messages that can be synchronized effectively with national policy and commander’s mission. MISO can have an incredible impact on a populace if it is planned, synchronized, and conducted properly.” – Reaching The Target Audience, a thesis presented to the Faculty of the U.S. Army Command. Is that how Donald Trump became president? Why the former executive chair of Breitbart News walks the halls of the White House? And why Alex Jones has become a household name and is friends with President Trump? That’s because you are not paying attention.